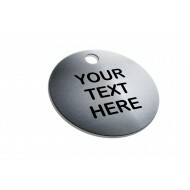 Buy Stainless Steel Tags Online! Easily search by model number or name! Select from a number of Stainless Steel Tags, 3" x 1" Machinery Tags, 3" x 3/4" Cable Tag, 1 1/2" Stainless Steel Device Tag & More! Take advantage of our quick & easy online checkout process usingExpress PO Checkout!